No matter where your travels take you, planning for cash withdrawals should always be part of your planning. Minimizing foreign exchange and ATM withdrawal fees is a great way to save money. A no foreign transaction fee debit card lets you withdraw money as you need it and thus avoiding the need to carry large quantities of cash. Considering that many large cities around the world have a pickpocket problem, this is a much safer way to manage your money . 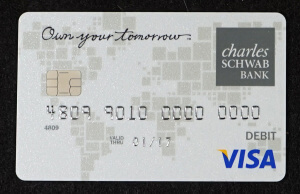 If you want an ATM card that doesn’t charge foreign exchange fees AND reimburses you for all fees charged by banks when you withdraw money-get the Charles Schwab Platinum Visa debit card. You have to open a Schwab brokerage account to qualify but you don’t have to actually fund the brokerage account. There is NO fee and if you ever need a place to start an IRA you’ve already got it. They are a great bank to do business with, too. The whole process took me 2 weeks from the time I submitted the application online to the day that I received the card. This will easily save me an estimated $10-$20 in fees for our upcoming 3 week vacation to Spain. That’s the cost of one nice dinner!